The Affordable Care Act (ACA), passed in 2010 under President Obama, is where the Contraception Mandate started. The ACA requires employer-sponsored health insurance plans to cover “preventive” healthcare services and medicines. The ACA instructed the federal agency Health and Human Services (HHS) to define what services and medicines would be considered “preventive.” Once HHS creates regulations (or rules), the rules are binding as federal law. HHS created the preventive healthcare rules in 2013. The agency included contraception among the services and medicines considered “preventive.” Voila - the Contraception Mandate: A federal mandate that employers must include contraception in the healthcare plans they offer employees. The Contraception Mandate is controversial because some religious groups find contraception morally unsound. After the rules were passed, the Obama administration faced a number of lawsuits against the HHS rules containing the Contraception Mandate. More recently, since Trump has been in office, the government has taken some actions to limit the Mandate. 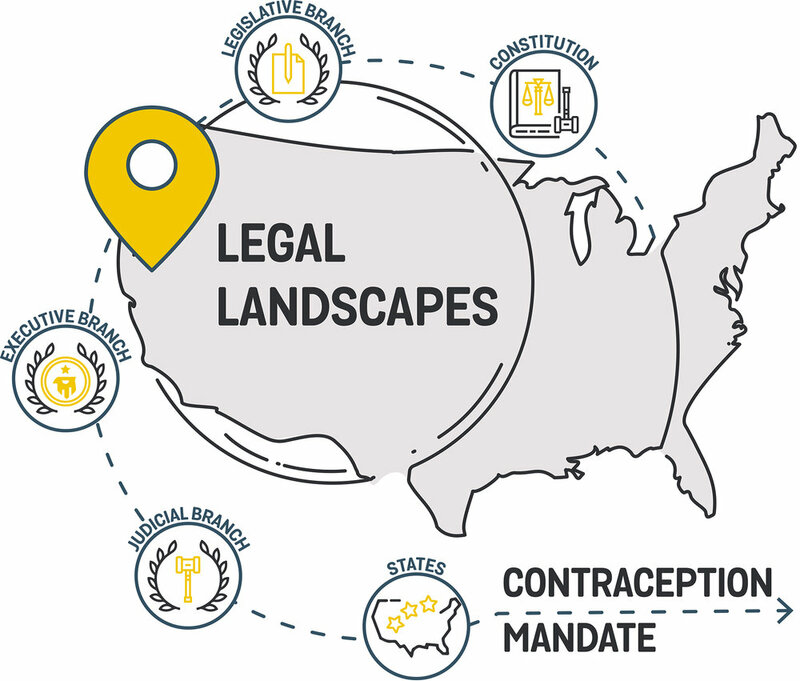 In this Legal Landscape, we have included a timeline of the important legal events relating to the Contraception Mandate, and we have organized the relevant laws and regulatory actions by their legal authorities. President Trump has vowed to give stronger support to religious groups wishing to get rid of the Contraception Mandate. Although the Health and Human Services agency (now under Trump) has not completely redefined “preventive” healthcare services to give contraception the boot, the agency has revised its rules to broaden the exemption for employers. Before the 2018 rule change, only nonprofit employers and non-public for-profit employers could claim the religious exemption. Now, the rules allow any entity or person who claims to have a religious or a moral objection to contraception can claim the exemption. Further, the rules allow exempt companies to opt out of giving notice to HHS. The 2018 HHS rules are currently facing litigation from a number of states, and two federal courts have placed “stays” on the rules going into effect. The states argue the rules violate federal law, as many women will lose contraception coverage if the exemption is expanded and the notice is optional. The government has admitted that over 70,000 women will lose contraception coverage as a result of the rules change, yet the ACA mandates that contraception is covered. Federal courts in California and Pennsylvania have agreed that the litigants are likely to succeed in their cases against the 2018 rule revisions, so the courts have prevented the rule from going into effect in the states which are litigating. The agency did not elect to redefine “preventive” healthcare services to omit contraception, presumably because that rule change would require formal “notice and comment” procedures and could face resistance even before passage. What laws are relevant to the contraception mandate? The list of federal topics includes the power to regulate “interstate” commerce, or commerce between the states (“Commerce Clause”). The Constitution itself is not specific enough to tell us everything. So we rely on the courts to tell us exactly what Congress’s powers include. The Commerce Power justifies the Employer Mandate (including the Contraception Mandate) in the Affordable Care Act. See Liberty University v. Lew in the Judicial column (a Court of Appeals case that ruled that Congress had the power to require employers to cover a certain standard of healthcare in the plans they offer their employees). Congress cannot violate the First Amendment. Other parts of the Constitution, like the Bill of Rights, limit the powers of Congress. The First Amendment is one of those limitations. The First Amendment includes the right for individuals to exercise their religion freely (“Free Exercise” clause). The First Amendment’s Free Exercise clause does not ban Congress from establishing the Contraception Mandate. The Free Exercise clause allows the government to place certain restrictions on religious exercise, as long as the government is not directly aiming to harm religious exercise. The government can make neutral laws (not intending to offend religion) that have indirect effects on religion. See Emp't Div., Dep't of Human Res. v. Smith in the Judicial section. In response to the Supreme Court decision interpreting the Free Exercise Clause (Emp’t Div. v. Smith), Congress enacted a law to more strongly protect religious exercise from burdensome laws. See Religious Freedom Restoration Act below (under “Congress”). Religious organizations/companies have used the RFRA to challenge the Contraception Mandate. And they have been successful. See Burwell v. Hobby Lobby in the Judicial section. The Affordable Care Act (ACA) requires employers’ insurance plans to cover a minimum standard of care (the “Employer Mandate”). Employers must cover certain “women’s health preventive services,” and the plan must include those services without cost-sharing (co-pay, deductibles or co-insurance). The ACA’s preventive services requirement does not specifically list contraceptives. The Act gave the federal agency Department of Health and Human Services (HHS) the responsibility to define exactly what preventative care services must be covered. See the Executive column for the Contraception Mandate. The Religious Freedom Restoration Act of 1993 limits the potential for the government to make laws that “burden” religious exercise. It says that, even if the government is making a neutral law (it does not pick on a particular religious group), if that law “significantly burdens” religious exercise, then the government must work toward its goal (the “compelling interest” the government is trying to achieve) so that it imposes the least burden possible on religious exercise. Federal agencies issue rules (or regulations) that help federal legislation get implemented. Federal agencies can only do what legislation empowers them to do. The Department of Health and Human Services (HHS) is the main federal agency responsible for health policy. The laws relating to healthcare empower HHS along with other agencies to help enforce them. The Affordable Care Act gives HHS authority to decide what kind of preventive women’s health services must be included in employers’ health insurance plans. HHS originally issued rules that qualify 20 types of contraceptives as “preventive women’s health services.” Employers had to include those 20 in the health plans they offered to employees without requiring any co-payment or cost sharing. Only religious organizations and nonprofits were able to get an exemption from that requirement, if they objected on religious grounds. However, Hobby Lobby and another for-profit company sued because they could not get the exemption. The Supreme Court ruled that HHS would have to change its rules. See Burwell v. Hobby Lobby in the Judicial section. As a result of that decision, HHS modified its rules. The new version allows for-profit companies (closely held corporations, not publicly traded) an exemption from the Contraception Mandate. Those companies now can object to the Contraception Mandate on religious grounds and request an exemption from providing contraception in the health plans they offer employees. The current HHS, now run by a different administration (Trump), can change its own rules again. It can make new rules, either to change the contraception mandate or to remove the contraception mandate from its definition of “preventive women’s health services” all together. In late 2018, Health and Human Services revised the federal rules on the Contraception Mandate so to decrease its effect. The new rules allow more employers to claim exemption from the Mandate and also allow exempt parties to avoid giving notice. The agencies involved are facing litigation over the rule changes (see Recent Events section above). Courts are important because they interpret the laws. When it comes to a dispute over whether something is allowed, the courts will tell us. Here are some important decisions relating to the Contraception Mandate. Congress had the right to pass the Employer Mandate and the Contraception Mandate. In Liberty University v. Lew (4th Circuit Court of Appeals, 2013), the court ruled that Congress has the power to regulate healthcare policies of employers. It said this is an area of commerce that has a national impact. It is a federal issue, and Congress has the right to regulate it, just like Congress can require employers to meet minimum wage and labor standards requirements. The Constitution’s First Amendment does not help employers get out of the contraception mandate. In Emp't Div., Dep't of Human Res. v. Smith (1990), two members of the Native American Church were barred from getting unemployment because they were fired for using peyote at a religious ceremony. Oregon state law prohibited people fired for “work-related misconduct” from getting unemployment benefits, and the law made no exception for religious exercise. The two men sued, claiming the law violated his right to Free Exercise (First Amendment) of the Constitution. The Supreme Court disagreed. A law that regulates general conduct does not violate the Free Exercise clause just because it happens to burden religion. To address the ruling, three years later, Congress passed a statute saying that any law placing a “substantial burden” on religious exercise would have to be well justified by the government. The law would have to meet the government’s goal with the least restrictions possible on religious exercise. See Religious Freedom Restoration Act of 1993 in the Legislative section. The Religious Freedom Restoration Act requires the government to allow religious organizations (including many for-profit companies) an exemption to the contraception mandate. In Burwell v. Hobby Lobby (2014), Hobby Lobby and another for-profit employer sued the government arguing that they should not have to pay for contraception in the employer health insurance plans they offer to employees. They argued that the types of contraception that are “abortifacient” (IUDs and “morning after” pills) are evil, and the Religious Freedom Restoration Act of 1993 entitles them to an exemption. The Supreme Court agreed that the RFRA entitles them an exemption. The Court ruled the government must offer for-profit closely held (non-public) employers an exemption similar to the one it gives to nonprofit and religious organizations. In Wheaton College v. Burwell (2014), a nonprofit religious college objected to the notice requirements that HHS imposed on entities claiming the religious exemption. Under the rules, Wheaton would send a form to the insurance provider which would trigger the insurer’s obligation to provide contraceptive coverage for Wheaton’s employees instead. Wheaton argued the notice requirement in HHS’s standard form made Wheaton complicit in obtaining contraception for its employees and that the RFRA protected it from having to do so. The Court agreed to make the HHS standard form optional for the exempt employers and said HHS would have already received notice that the employer was claiming the religious exemption and so could use that information to ensure the employees could get contraception coverage in lieu. The Supreme Court did not make a decision on the merits in this case. States can choose to require contraception coverage in employer-sponsored health plans. The Hobby Lobby Supreme Court ruling required the federal government to give exemptions to the contraception mandate for religious groups or companies. The Religious Freedom Restoration Act only applies to the federal government. According to the Guttmacher Institute, 28 states require that contraceptives are included in health insurance plans. The state laws bind the health insurers, not the employers. Of the 28 that require insurers to include contraception, only 3 prohibit cost-sharing by the individual (like the federal law).